Hello there amazing tacos filled with marinated veggies and marinated beans. This cilantro chile lime marinade is versatile and addictive. Zingy, cilantroey and flavorful. Blend up the marinade. 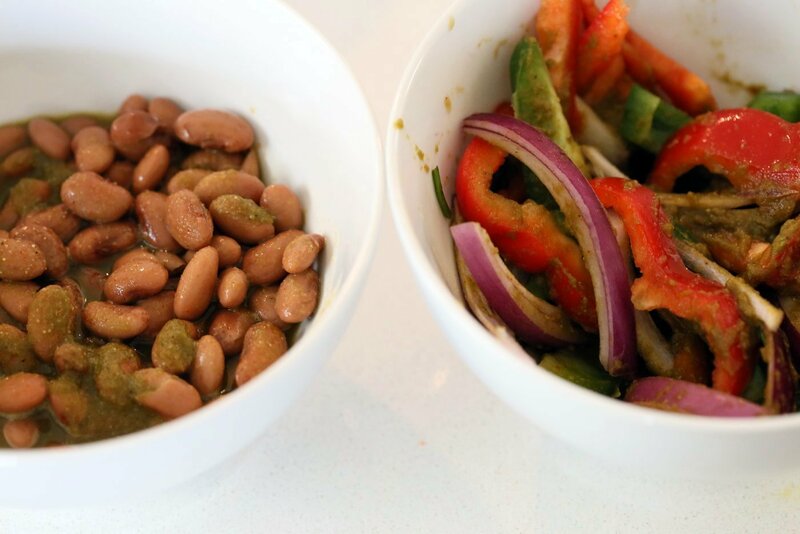 Marinate the beans and veggies for a few minutes. Cook them in a skillet, fill up your tortillas, add other toppings and done. Simple ingredients that all come together to make these delicious and quick fajita tacos. This recipe is easily doubled, which you must, because believe me about that marinade. You will want to put it on all kinds of beans and veggies and drizzle more of it on all sorts of tacos and wraps. If you make it do leave me a comment, or tag me #veganricha on Instagram! Marinate the veggies and beans. Cook until tender and sizzling, serve over warm tortillas or make a taco bowl with crunchy greens. Pin this recipe for later! Easy flavorful, beany vegan tacos. Use other beans for variation. 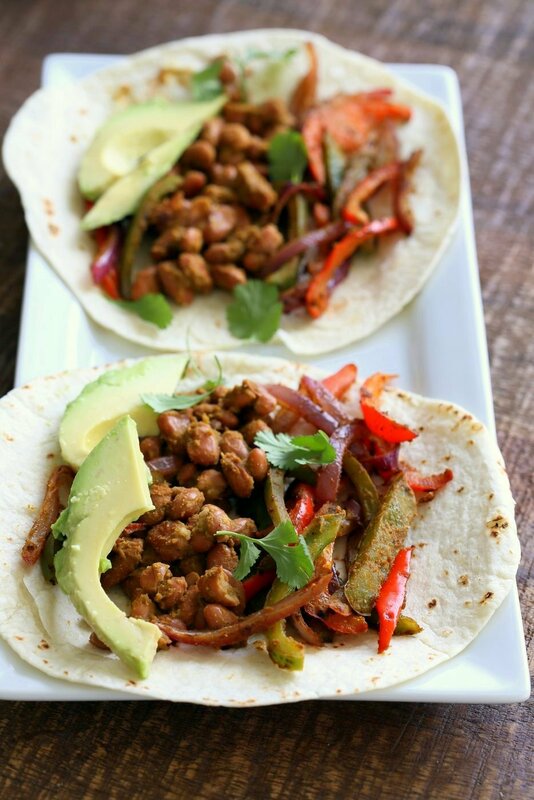 Veggie Pinto Bean Fajita Tacos with Cilantro Chile Marinade. Amazing Fajita Marinade for veggies and Beans. 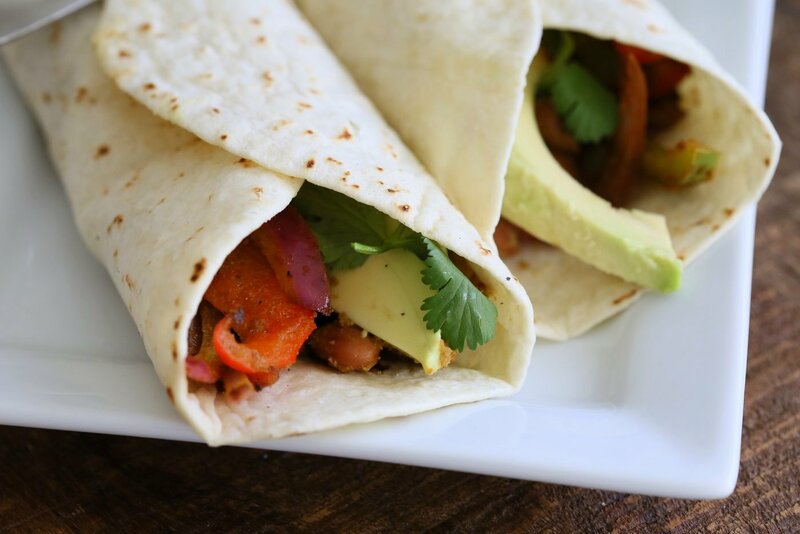 Vegan Gluten-free Soy-free Vegetarian Fajita Recipe. Easily doubled. Blend all the ingredients under marinade in a small blender until smooth. In a large bowl, add the sliced veggies. Add half of the marinade and toss well. In another bowl add the beans and the remaining marinade and toss well. Let sit in the refrigerator for 15 mins to half an hour. Heat a skillet over medium high heat. Add a tsp of oil. Remove veggies from the marinade and add to the skillet. Cook until tender. Add a dash of chipotle pepper powder for smokyness towards the end. Cook a min longer to sear the veggies. Transfer to a bowl. Transfer the beans and the marinade into the same skillet. Add any leftover marinade from the veggie bowl as well. Cook over medium heat until the marinade thickens. Taste and adjust salt and spice. Assemble the fajita tacos with warmed tacos or tortillas, generous helping of the grilled veggies and sizzling beans. Add some salsa, avocado slices or guacamole, a dash of black pepper, and lemon juice. Serve hot! Made these for dinner and they vanished before I could get a good helping. So I made another batch! Wowza, Richa! These look amazing. I love pinto beans, and I love tacos, so you are pretty much making my day right now. I will definitely be making these for dinner in the next few days, maybe even without the tortilla, in just a big taco bowl? YUM. yes of course, taco bowl for the win! 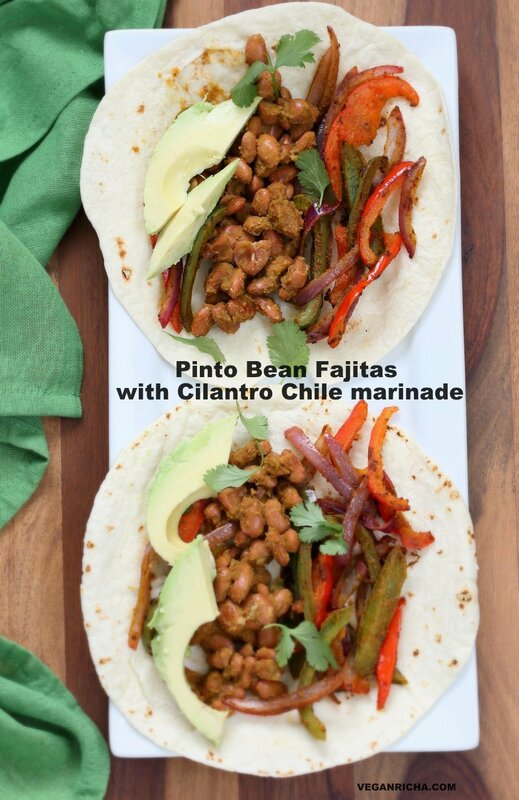 I’m def making this for lunch today, cooked up some pinto beans last night and was looking for a yummy way to use them. But I have a question; are tortillas counted in the nutritional info provided? You can serve these in a bowl with crunchy greens or tortillas of choice, wheat, corn or other. I dont have nutritional info on the recipe. But if you do compute, use the tortillas you are using in the calculation. Made these for dinner for my husband and I the other night. I doubled the recipe so we would have enough leftovers for lunch the next day and WE ATE IT ALL THAT NIGHT. Seriously that marinade is incredible. Thanks so much!! That cilantro marinade (pesto) raw is addicting. I dip tortilla chips in it straight. I pour it over hummus. I make guacamole with it. I have a new food I cannot live without. You rock. Same here Lisa. Awesome sauce!!! Started following you – This looks so good!! I’d love to have you share it on our Taco Tuesday link up! Wow, another total winner! Thank you Richa, this was sooooo good. I added some sliced cremini to the veggie mix and served the tacos with a big green salad. Next time I will make double the pesto: I agree with Lisa, it is fabulous. I made these tonight. Delicious! Loved the cilantro and lime marinade. So good. Followed your recipe exactly except added a 1/2 tsp maple syrup to the marinade. The small amount of added sweetness seemed to take it up a level in taste. These will definitely be a regular for me. Also will make the marinade as a substitute for store bought hot sauce. Oh my goodness, this marinade is amazing, thank you so much! I made this for the first time today and it was so yummy! I will add this to my very favorites. What is the blender you are using to make the marinade or dressing ? Thanks so much for the recipe!!! What brand of tortilla wraps did you use? Would you be able to provide a link please? I made these tonight because I wanted to do something different with pinto beans. This was delicious. I stopped myself from eating the whole thing because i still had Kheer (your brown rice kheer recipe) to have afterwards. The marinade was amazing. Thank you. These were absolutely amazing. What a wonderful recipe and marinade. This will become a regular meal in our house for sure!! Thank you!